With classic & twist modes and excellent gameplay, Word be-gone stands out from rest of the crowd. The game can be enjoyed all age groups. Highly recommended. Word Be-Gone is the latest puzzle by the creative puzzle – writing team of David L. Hoyt and Colin Morgan. When the creator is so successful, you can imagine how amazing the game would be!. Giving a new twist to the word-finders, here they have tried the concept of “Swiping”. Your task is simple: you have to swipe all the words from the board one by one and clear the board completely. The goal is same at every level but only the challenge rises to a new stake. As we are talking about clearing the entire board, therefore the problem is not only about finding words, it’s about finding the “right” words i.e. the words that the developer wants you to find. There may be some other combinations as well. But it’s only the end of the chain that will tell you if there was a weak link or not. Strategizing your game-play will certainly help you in the long run. There are two gaming modes: classic and twist. In the classic mode, you can swipe the words horizontally, vertically and diagonally. There are the only three options that you have. Going beyond these limits is not allowed. However, if you do feel that creative ideas can fall from anywhere and can lead into any direction, Twist would be the right mode for you. Here, the only condition is: letters should be adjacent. So as long as the chain is continuous, you can join words anyhow no matter if it’s a zigzag or a loop. When the wordplay is so random that it can follow any path, it’s certain to get confused. To help you in such “stuck” situations, there are hints to your rescue. A hint will reveal a word to you. But as there are number of words in a level, you might need more of them. These hints come at a cost and you can buy them via in-app purchases. 10 hints for a dollar are affordable and enough to get you past 4-5 levels easily if you’re good at it. Players from any age group would like Word Be-Gone; reason being that it’s easy to pick up and hard to put down. Even an elementary student has a good knowledge of words. So the first few levels are well under his range. Beyond that, the parents would encourage their child and help them get better at it because in the end, it’s all about learning new words. 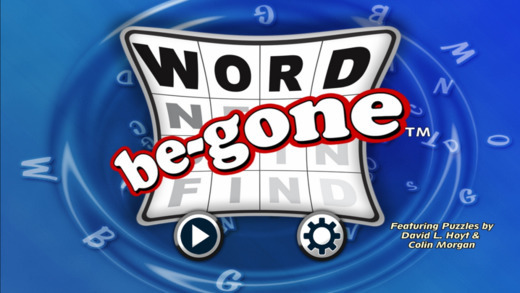 So overall, what I think of Word Be-Gone is that it’s a fun-educational game that everybody should give a try at. The app has been developed by Jeffrey Benson and is compatible with iPhone, iPod touch and iPad and requires iOS 6.0 or any later version of the OS. Moreover, it’s available for free in the App Store. So don’t forget to check it out! 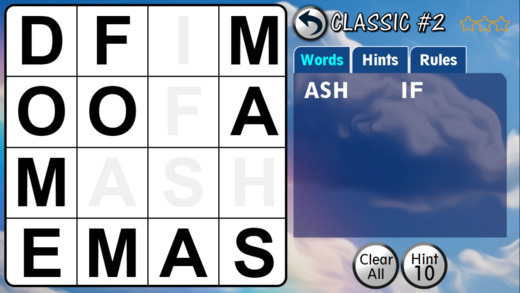 Pros: easy to start with; challenging levels; engaging concept; many new words to learn; good for all age-groups; different gaming modes; free.